Welcome to CampgroundTour.com. We’ve made it our mission to answer the “find campgrounds near me,” or “show RV parks near me” question with the most accurate, timely, and easy-to-use database of campgrounds nationwide. CampgroundTour was born from a desire to explore – the staff at CampgroundTour are fellow RV and camping enthusiasts who were frustrated by the fragmented information available on campgrounds and RV parks. 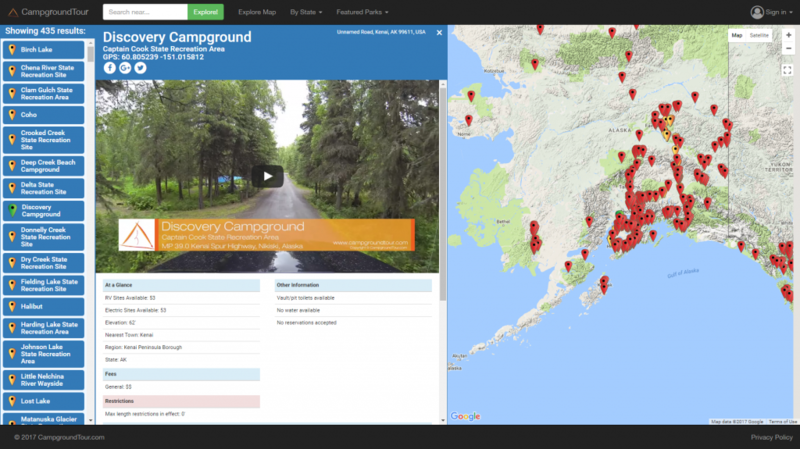 As a result, CampgroundTour was created. Let our interactive campground directory help locate the absolute best camping destination for your next adventure! We designed our interactive map from the ground up to provide an excellent user experience. Access the map from a desktop computer, tablet, or mobile phone, and discover your next adventure, wherever you are. Stay tuned for the release of some exciting new features, search capabilities, and social editing to take your planning even further! Getting there is only half the battle. Far too often, we’ve set out armed with reviews and photos found online only to find a campground wasn’t what we were expecting. What if you could actually see your destination while you’re planning? With CampgroundTour.com, you can. We are working hard to catalog detailed drive-through tours of camping destinations. We’ve started small, but are expanding quickly. Discover new gear ideas through our Gear Essentials series. We sift through thousands of products across a wide range of camping and outdoor related categories to find the gear that works, and works well. Once you are geared up, join us in our Discover Your Destination series. We explore new places and discover the hidden gems that make travel exciting. We hope you enjoy CampgroundTour. We are constantly working on improving our campground directory, working to streamline the experience, and bring additional value. Keep Exploring and discover new adventures. At CampgroundTour, we strive to provide the most comprehensive listing of campgrounds and RV parks anywhere. By using our interactive map, see your next adventure before even leaving home. Browse the map and explore new opportunities for camping near you. Or, search our database of over 15,000 facilities. From camping essentials to innovative new products, our Gear Essentials series has you covered. Looking for unique experiences or sights to see once you arrive at your destination? Check our Discover Your Destination series for inspiration! At CampgroundTour, we strive to provide the most comprehensive listing of outdoor camping and RV facilities available!